Professional-grade Flat Blackjacks like the original law enforcement models made decades earlier. - Top quality heavy duty leather made in the USA with high density cow leather and steel shank, these blackjacks or saps are the best of an old school tool of law enforcement and self defense. No need to bruise your knuckles or risk breaking your hand, these black jack impact weapons will save you the trouble. 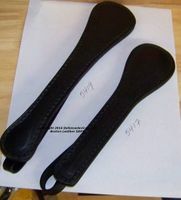 There are two types of straps that are designed into these saps, an attached strap and a loop strap. The attached strap is sewn in parallel to the handle and helps keep your hand on the handle. The loop is attached to the end and can be used as a wrist strap as well as an extender. These are hand made in a factory in rural Illinois using best quality drum dyed leather in 2 or 4 plys to provide a product of lasting quality and effectiveness. The Midget #5410-1 is only 6.5 inches long weighs 9.5 oz and has a retention strap. Price $21.99. The Junior Sap is Only 8 inches long. - 9.9 oz. Durable, heavy gauge leather encases molded lead weight with spring steel shank and loop handle extending from the end. The 4 ply Midget #5415-1 is only 6.5 inches long weighs 9.5 oz and has a retention strap. Price $23.99. The Junior Sap is Only 8 inches long. - 101/2 oz. Most models have the retention-style strap. It helps make sure you do not lose the Sap should you lose your grip. The Loop handle serves the same purpose but also can extend your reach. Models with the loop handle include 5413 and 5418. Restriction: This item is illegal in and cannot be shipped NY, CA, MA, MI, IL. These saps may be illegal in your state or city, check your local laws to make sure. These are sometimes referred to as truncheons or slung shot. Remember our low flat rate shipping of only $7.95 and no handling fee. Or, if your order totals over $99, shipping drops to only $3.95 for your entire order. Leather Billy Clubs can be found below. The midget sap was exactly what I was looking for at a good price. I like it better than I thought I would. Arrived quickly. Will order from them again. Great slap jack fits in your back pocket. get item of sell defense.